"Darlan" redirects here. For the racehorse, see Darlan (horse). Jean Louis Xavier François Darlan (7 August 1881 – 24 December 1942) was a French admiral and political figure. He was admiral of the fleet and Chief of Staff of the French Navy in 1939 at the beginning of World War II. After France signed an armistice with Nazi Germany in 1940, Darlan served in the pro-German Vichy regime, becoming its deputy leader for a time. When the Allies invaded French North Africa in 1942, Darlan was the highest-ranking officer there, and a deal was made, giving him control of North African French forces in exchange for joining their side. Less than two months later he was assassinated. Darlan was born in Nérac, Lot-et-Garonne, to a family with a long connection with the French Navy. His great-grandfather was killed at the Battle of Trafalgar. His father, Jean-Baptiste Darlan, was a lawyer and politician who served as Minister of Justice in the cabinet of Jules Méline. Georges Leygues, a political colleague of his father who would spend seven years as Minister of the Marine, was Darlan's godfather. Darlan graduated from the École Navale in 1902. During World War I he commanded an artillery battery that took part in the Battle of Verdun. After the war Darlan commanded the training ships Jeanne d'Arc and the Edgar Quinet, receiving promotions to frigate captain in 1920 and captain in 1926. Thereafter Darlan rose swiftly. He was appointed Chef de Cabinet to Leygues and promoted to contre-amiral in 1929. In 1930 he served as the French Navy's representative at the London Naval Conference and in 1932 he was promoted to vice-amiral. Subsequently in 1934 he took command of the Atlantic Squadron at Brest. He was promoted to vice-amiral d'escadre in 1936 and being appointed Chief of the Naval Staff from 1 January 1937, at the same time promoted to amiral. As head of the Navy he successfully used his political connections to lobby for building program to counter the rising threat from the Kriegsmarine and Regia Marina. After attending the Coronation of George VI Darlan complained that protocol had left him, as a mere vice admiral, "behind a pillar and after the Chinese admiral". In 1939 he was promoted to Amiral de la flotte, a rank created specifically to put him on equal terms with the First Sea Lord of the Royal Navy. 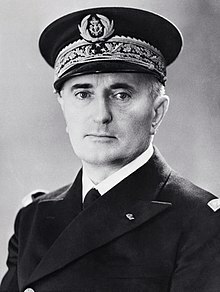 After the declaration of war in September 1939, Darlan became Commander-in-Chief of the French Navy. Darlan was immensely proud of the French navy which he had helped to build up, and after Axis forces defeated France (May–June 1940), on 3 June he threatened that he would mutiny and lead the fleet to fight under the British flag in the event of an armistice. Darlan promised Churchill at the Briare Conference (12 June) that no French ship would ever come into German hands. :62 Even on 15 June he was still talking of a potential armistice with indignation. Darlan appears to have retreated from his position on 15 June, when the Cabinet voted 13–6 for Camille Chautemps' compromise proposal to inquire about possible terms. He was willing to accept an armistice provided the French fleet was kept out of German hands. On 16 June Churchill's telegram arrived agreeing to an armistice (France and Britain were bound by treaty not to seek a separate peace) provided the French fleet was moved to British ports. This was not acceptable to Darlan, who argued that it would leave France defenceless. That day, according to Jules Moch, he declared that Britain was finished so there was no point in continuing to fight, and he was concerned that if there was no armistice Hitler would invade French North Africa via Franco's Spain. That evening Paul Reynaud, feeling he lacked sufficient cabinet support for continuing the war, resigned as Prime Minister, and Philippe Pétain formed a new government with a view to seeking an armistice with Germany. Darlan served as the Minister of Marine in the Pétain administration from 16 June. :139–40 On 18 June Darlan gave his "word of honour" to the British First Sea Lord, Sir Dudley Pound that he would not allow the French fleet to fall into German hands. Petain's government signed an armistice (22 June 1940) but retained control of the territories known as "Vichy France" after the capital moved to Vichy in early July. :139–40 General Charles Noguès, Commander-in-Chief of French forces in North Africa, was dismayed at the armistice but accepted it partly (he claimed) because Darlan would not let him have the French fleet to continue hostilities against the Axis powers. Churchill later wrote that Darlan could have been the leader of the Free French, "a de Gaulle raised to the tenth power", had he defected at this time. De Gaulle's biographer Jean Lacouture described Darlan as "the archetypal man of failed destiny" thereafter. Despite Darlan's assurance to Churchill, Churchill had remained concerned that Darlan might be overruled by the politicians, and this concern was not allayed by Darlan becoming a government minister himself. Darlan repeatedly refused British requests to place the whole fleet in British custody (or in the French West Indies), and in attempts to get the British to release French warships gave a version of the armistice terms inconsistent with what the British knew from other sources to be the case. British lack of confidence that Darlan was being straight with them (one government adviser minuted that he had 'turned crook like the rest'):149 and that even if honest he could deliver on his promise led to Operation Catapult, when British forces attacked and destroyed part of the French fleet at Mers-el-Kébir in North Africa (3 July 1940). The plans for "Catapult" had been drawn up as early as 14, 15 or 16 June. Darlan was at his house at Nérac in Gascony on 3 July, and could not be contacted. Thereafter, French forces loyal to Vichy (most of them under Darlan's command) fiercely resisted British moves into French territory, and sometimes cooperated with German forces. However, as Darlan had promised, no capital ships fell into German hands, and only three destroyers and a few dozen submarines and smaller vessels passed into German control. Darlan expected Germany to win the war and saw it as to France's advantage to collaborate with Germany. He distrusted the British, and after the armistice of June 1940 he seriously considered waging a naval war against Britain. Darlan came from a republican background and never believed in the National Revolution; for example, he had reservations about Pétain's clericalism. However, by 1941 Darlan had become Pétain's most trusted associate. In February 1941 Darlan replaced Pierre-Étienne Flandin as "Vice President of the Council" (prime minister). He also became Minister of Foreign Affairs, Minister of the Interior, and Minister of National Defence, making him the de facto head of the Vichy government. On 11 February he was named Pétain's eventual successor, in accordance with Act Number Four of the constitution. As a prominent figure in the Vichy government, Darlan repeatedly offered Hitler active military cooperation against Britain. Hitler, however, distrusted France and wanted it to remain neutral during his planned attack on the Soviet Union. Darlan promoted a political alliance between Vichy French forces and the German Reich through the Paris Protocols of May 1941. However, the Germans soon became suspicious of Darlan's opportunism and malleable loyalties as his obstructionism mounted; not only did he refuse to provide French conscript labour, but he also insisted on protecting Jewish war veterans and only reluctantly enforced anti-Semitic laws. After the British victory in the Syria–Lebanon Campaign of June–July 1941 and Hitler's failure to defeat the Soviets quickly, Darlan moved away from his policy of collaboration. Because he reported only to Pétain, Darlan exercised broad powers, although Pétain's own entourage, including Darlan's rival, General Maxime Weygand (who opposed Darlan's plan to allow German use of bases in the French Empire, but was dismissed at German insistence in November 1941), continued to wield considerable influence. In running the French colonial empire, Darlan relied heavily upon the personal loyalties of key army and naval officers throughout the colonies to head off Free French-affiliated secessionism. In January 1942 Darlan assumed a number of other government posts. In April 1942 Laval, whom the Germans considered more trustworthy, forced Darlan to resign his ministries. Darlan retained several lesser posts, including that of commander-in-chief of the French armed forces. The "Darlan deal" proved highly controversial, as Darlan had been a notorious collaborator with Germany. General de Gaulle and his Free France organization were outraged; so were the pro-Allied conspirators who had seized Algiers. Some high American and British officials objected, and there was furious criticism by newspapers and politicians. Roosevelt defended it (using wording suggested by Churchill) as 'a temporary expedient, justified only by the stress of battle'. :261 Churchill persuaded an initially sceptical secret session of the House of Commons, saying that Eisenhower's recognition of Darlan was right, and even if it was not quite right, it had meant French rifles being pointed not at the Allies, but at the Axis: "I am sorry to have to mention a point like this, but it makes a lot of difference to a soldier whether a man fires his gun at him, or at an enemy...":275 Later, American historian Arthur Funk maintained that the "deal with Darlan" was misunderstood by the critics at the time as an opportunistic improvisation. Funk claimed Darlan had been in talks with American diplomats for months about switching sides, and when the opportunity came he did so promptly. The "deal" thus was the result of a long and carefully considered Allied plan for reaching a political and military accord with Vichy. It followed a model drawn up in London and already approved at the highest levels. The "deal" was even more upsetting to Berlin and to the Vichy government. Pétain stripped Darlan of his offices and ordered resistance to the end in North Africa, but was ignored. The Germans were more direct: German troops occupied the remaining 40% of France. However, the Germans paused outside Toulon, the base where most of the remaining French ships were moored. Only on 27 November did the Germans try to seize the ships, but all capital ships were scuttled, and only three destroyers and a few dozen smaller ships were captured, mostly fulfilling Darlan's promise in 1940 to Churchill. On the afternoon of 24 December 1942, Fernand Bonnier de La Chapelle shot Darlan in his headquarters; Darlan died a few hours later. Bonnier de La Chapelle was a youth of 20, the son of a French journalist. He was a monarchist, and opposed to Vichy. He was involved with a royalist group that wanted to restore the pretender to the French throne, the Count of Paris. Bonnier de La Chapelle was arrested immediately, tried and convicted the next day, and executed by firing squad on 26 December. Darlan was unpopular with the Allies – he was considered pompous, having asked Eisenhower to provide 200 Coldstream Guards and Grenadier Guards as an honor company for the commemoration of Napoleon's victory at Austerlitz. It was said that "no tears were shed" by the British over his death. Harold Macmillan, who was Churchill's adviser to Eisenhower at the time of the assassination, wryly described Darlan's service and death by saying, "Once bought, he stayed bought." ^ a b c Korda, Michael (2007). Ike: An American Hero. New York: HarperCollins. p. 325. ISBN 978-0-06-075665-9. Retrieved 10 May 2013. ^ Auphan, Paul; Mordai, Jacques (1959). The French Navy in World War II. Naval Institute Press. p. 10. ISBN 9781682470602. Retrieved 3 February 2018. ^ Horne, Alistair (1993). The Price of Glory: Verdun 1916. New York: Penguin. p. 248. ISBN 978-0-14-017041-2. ^ Auphan, Paul; Mordai, Jacques (1959). The French Navy in World War II. Naval Institute Press. p. 17. ISBN 9781682470602. Retrieved 3 February 2018. ^ a b c d e f g Bell, P M H (1974). A Certain Eventuality. Farnborough: Saxon House. pp. 141–42. ISBN 0 347 000 10 X. ^ Arthur L. Funk, "Negotiating the'Deal with Darlan'." Journal of Contemporary History 8.2 (1973): 81–117. ^ a b c Gilbert, Martin (1986). Road to Victory: Winston S. Churchill 1941–1945. London: Guild Publishing. ^ "Darlan Shot Dead; Assassin Is Seized". New York Times. 25 December 1942. p. 1. Retrieved 4 November 2010. ^ Havens, Murray Clark; Leiden, Carl; Schmitt, Karl Michael (1970). The Politics of Assassination. Prentice-Hall. p. 123. ISBN 9780136862796. ^ Chalou, George C. (1995). The Secret War: The Office of Strategic Services in World War II. Diane Publ. p. 167. ISBN 9780788125980. Retrieved 10 May 2013. ^ Root, Waverley Lewis. The Secret History of the War, Volume 2 C. Scribner's Sons, 1945. Funk, Arthur L. "Negotiating the'Deal with Darlan'." Journal of Contemporary History 8.2 (1973): 81–117.